Have you noticed something lately? One of the BIGGEST fashion rules has been thrown out the window this year. Extra long sleeves are a big trend for fall 2016. Remember stylists and those “in the know” telling you that your clothes should always fit? Oversized clothing and especially extra long sleeves are HUGE (ha ha! pun intended) this year. I suppose that this trend comes along with a personal assistant for hand washing, using the bathroom, eating or basically doing anything else that requires the use of your hands or fingers. Everyone knows that the use of your hands is totally overrated. Thank heavens designers have finally worked that into their clothing. Am I terribly old fashioned thinking that clothing should fit the body? Maybe I’m just jealous because I cannot rock this trend without looking and feeling ridiculous, although in winter I’m sure it is a great way to keep your hands warm. One thing I see repeatedly in fashion shows is very thin models wearing what looks like giant’s clothing. Is that fashionably dishevelled? Or just, ” I had a banging night and am too hungover to care so I grabbed my monster boyfriend’s gigantic sleeping bag sweater.” Cause I’ve been there but I didn’t call it a trend. This trend has been going on for years. How can they call a classic fabric like velvet a trend? Anyhoo…I adore this trend. I may own several pairs of boots and about five or more blazers/jackets in velvet. I was ahead of the trend in acquiring my collection. 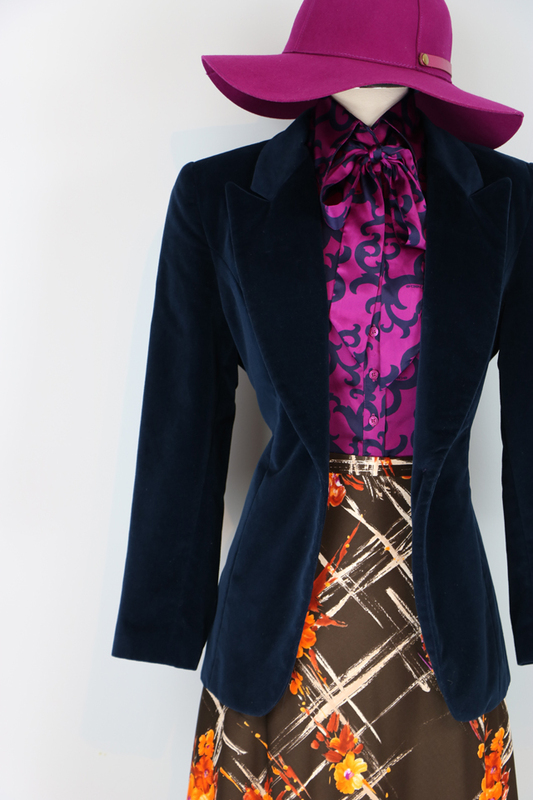 This lovely velvet blazer is for sale in my Etsy store. Brilliant if you have a long skinny neck and are tall and willowy otherwise, they can visually shorten you by a couple of inches immediately. Ruffles are nice if you don’t have much of a chest and are looking for some extra padding. No one rocks a ruffled blouse better than my friend Melanie from Bag and a Beret. Seriously…does it get any better than this? Nope…I think not. Metallic is hot and I’m loving it. I just picked up this gold leather blazer and added it to my Etsy store. Donna Summers made me do it. Disco is not dead! Turtlenecks under dresses is not a new thing, but I like it. When you live in a climate that can get to -20 C in winter you’re wearing turtlenecks under your PJs. Maybe that’ll be the 2017’s trend! You read it here first folks! Wearing plain PJs is so last season. You simply must add a turtleneck! Of course, if you get night sweats you’ll need a “tear-away turtleneck”. Someone at Zara get on that right away! Plaid is always popular in Fall. Apparently, plaid overcoats are extra special this year though. I *may* have bought a long plaid blazer from Holt Renfrew at one of my local consignment stores about a month ago. I swear I did this before I knew it was a trend. I paired it with a velvet midi dress, one of my most worn finds this season. Dusty pink and yellow looks wonderful on models and makes me look like I’m about to heave. I’ll be passing that trend by but have picked up some awesome dusty pink booties. I’ll be sharing the rhinestone DIY with you in the next few days. I suppose we have Hilary Clinton to thank for bringing back this look. It can look super chic, I’m still on the fence about this trend for myself, probably just because I haven’t come across one I like yet while thrifting. I do believe it can be very elongating. 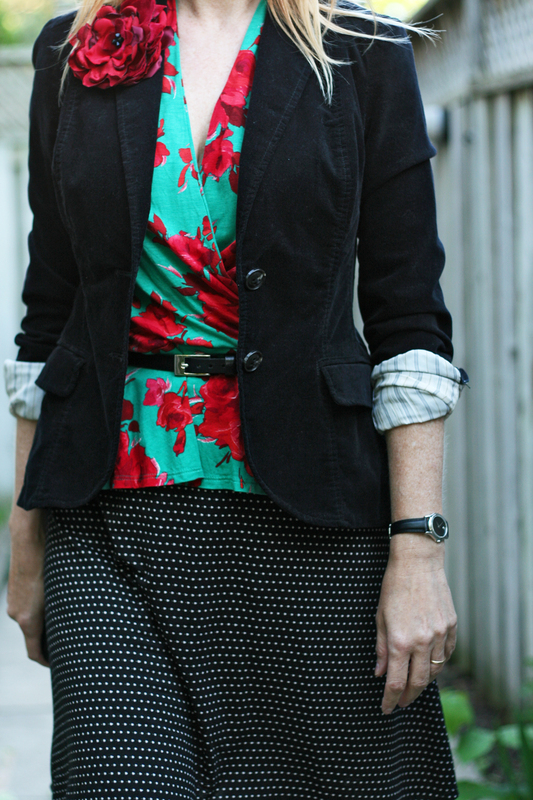 Fall Florals are a huge love of mine. They have been for years. 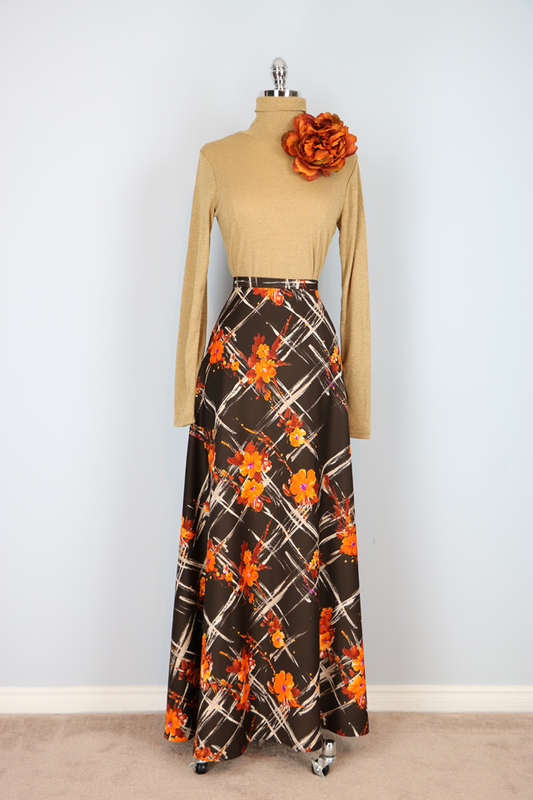 Just listed this maxi skirt in my Etsy store. 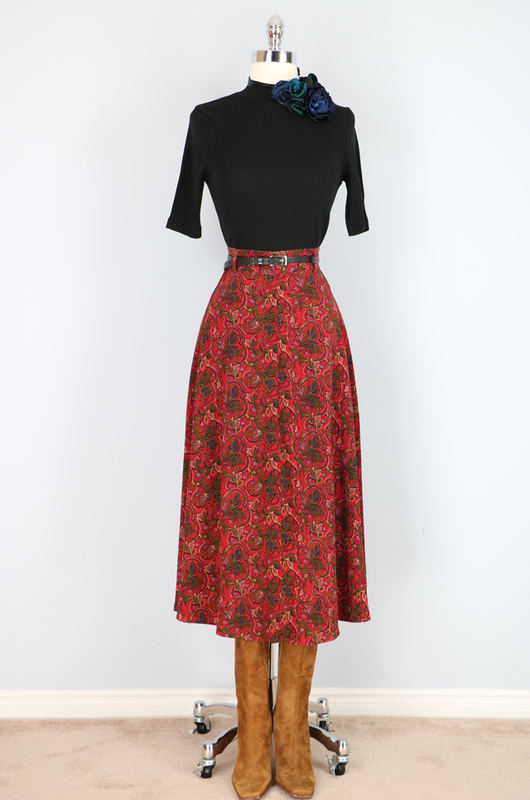 Gorgeous red fall floral midi skirt now in my Etsy shop. Aren’t the colours in this skirt gorgeous? For sale. 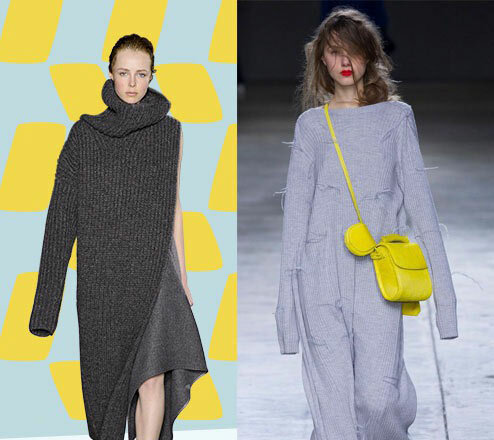 Which of these falls trends are you wearing these days? Maybe even more importantly, which fall trends are you willing to pass up? I’ll probably be giving the oversized sleeves and jumpsuits a miss. They just don’t work very well on my short stature. But velvet, yes, baby, bring it on. I must say, Suzanne, I love your sense of style. Just so flamboyant and elegant, all at the one same time. Thank you for such a wonderful compliment Sheela. You have such a wonderful ability to take risks with your outfits that I appreciate. I don’t even know where to begin Suzanne. There are so many beautiful combinations here. Fall colors are most definitely my favorites and you look so spectacular in ALL of them. I love all of the velvet jackets and kudos to you for being so ahead of this trend. 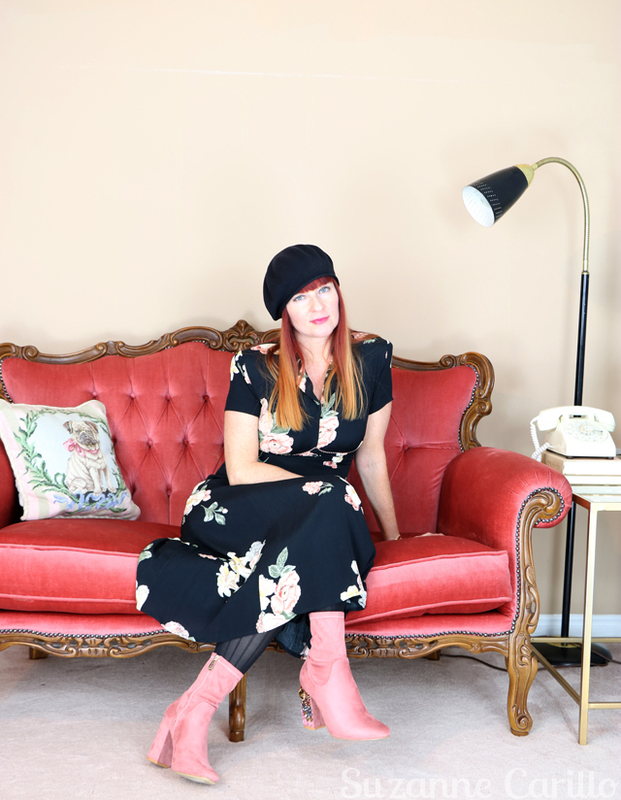 I’m all over the stylings that combine velvet blazers jeans (patterned or not) and berets. The skirt that you combined with the gold leather blazer is so gorgeous I can’t stand it . So many bright glorious colors!!! Is that available in your Etsy boutique? Size? 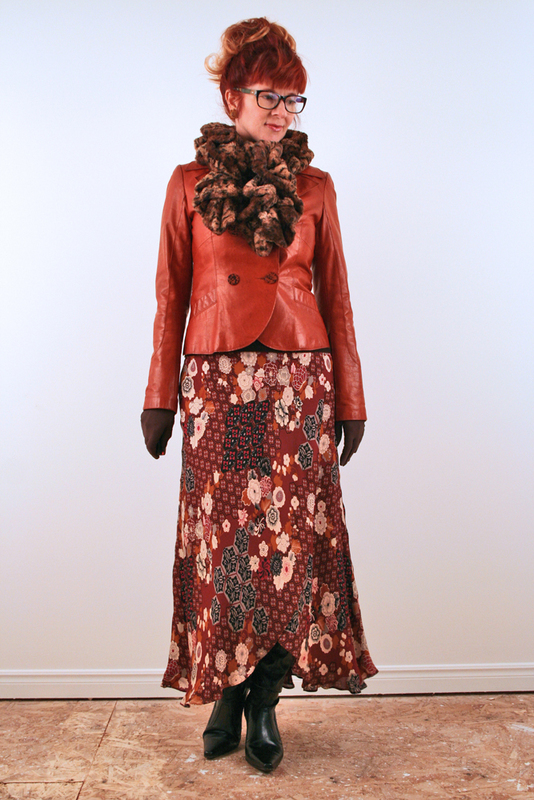 Do you realize that the red velvet knee length coat with pockets has that “large” look you were saying you can’t do? Even the sleeve length looks a bit long. Better hang on to that one; it looks great on you!!! I haven’t listed that skirt as of yet…but I can if you are interested in it. I don’t know if it qualifies as *vintage* (they are picky about that on Etsy) as I think it might be late 90’s or even 2000. It is Jones New York (made in Vietnam) made out of a very stretchy material (98% cotton, 2% lycra) and a size 6. Waist is 31″ Length is 21.5″. The design and colours on it as you saw is all kinds of awesome. It’d list for $35 plus $15 shipping (shipping costs from Canada are HUGE). It is unlined. There are no flaws on it. If you are interested just contact me directly at info@bisous.biz and we can organize the rest and skip listing it on Etsy. You are right, that velvet jacket is large on me, even the sleeves. It is very cozy to wear but I still feel a bit like I’m drowning in it, but honestly, drowning in velvet isn’t such a bad thing. The waist is a bit large and I’m afraid the hip might be too small. I can do an 8 skirt but a 6 …? I hope to see you in it soon; perhaps draped across your velvet fainting couch. I also loved that photo of you in the hat, lying across that couch. You are SO cool!! I just realised that I quoted you in Canadian dollars. The USD prices would be less 25% what I quoted you. Sorry about that. You are so stylish it nearly explodes my head. I can’t do most of these trends for various reasons mainly connected to body shape, though extra long-sleeve trends get me a bit excited since it means maybe some things will have sleeves that are long enough for me. ON the other hand, sleeves get in the way and I tend to always push mine up. 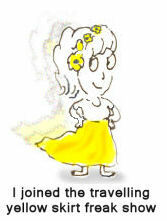 I CAN do dusty pink and soft yellow, they are perfect for me, and two of my favourites. I don’t have your rich, strong colouring ( mega-envy ) and I also envy both your velvet blazer collection and your ability to wear blazers. I loose any neck I have when I wear a blazer but oh how I love velvet. I will fantasise about a flat collared velvet jacket in muted gold. You look amazing as always! I have a very short neck as well but I find if the blazer fits very well I don’t seem to lose my neck. I really didn’t wear very many of these colours when I was blond. 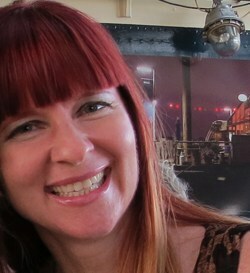 I think changing my hair colour changed the way I dressed entirely. I’ll keep my eyes peeled for your flat collared velvet jacket in gold. What size are you in blazers? I adore the soft unstructured red jacket. Where to start? Hilarious as always and yet so on point! Or en pointe? I reckon you would rock a pant suit. Those dusty pink boots are so gorgeous! But not for the rain or mud. Very dainty ladies only. When my husband brought back my first pair of Ugg boots from Australia I literally wore them for 2 years without taking them off. I wore them in the house as slippers. Man I loved those boots! They wore out so he bought me a new pair but now my old feet don’t like flat boots anymore. I’m so disappointed! I have to wear runners with insoles to help my fasciitis. This aging thing is cramping my style vibe. I must pop by to see that shirt and strappy dress. It does make me laugh….do these people get paid for telling us that velvet, tartan, dark florals and wearing jumpers under stuff are “trends”? Any fool could sit on a wall in a busy city centre to see that. Mind you, if they did that in my town they’d be forgiven for thinking that wolf fleeces, fake Ugg boots, almost transparent black leggings worn as trousers and any colour as long as it’s grey is a trend! 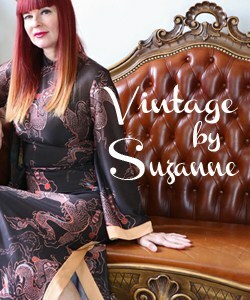 You have really inspired me Vix to totally surrender myself to the world of vintage and secondhand clothing. As usual, all of your outfits in this post are rich in colour and texture, and look beautiful on you. Alas, I shall not be on-trend this fall as I have none of the items you mention, except for one lonely velvet jacket which I rarely wear as I find it too warm to wear inside, and not warm enough to wear outside. I do agree that no one rocks a ruffled blouse like Mel. It is amazing some of the fashion ideas you see on the runways. They just aren’t all functional!! But maybe it’ll be good to have the extra long sleeves—isn’t that what people used before kleenex?? I found one velvet piece in my closet (it was a hand me down from my mother), so at least I get to join in on that one!! I also tried the pink & yellow (although mine was more gold)!! I’m always game for different color combinations!! You are definitely one hot chickadee!! 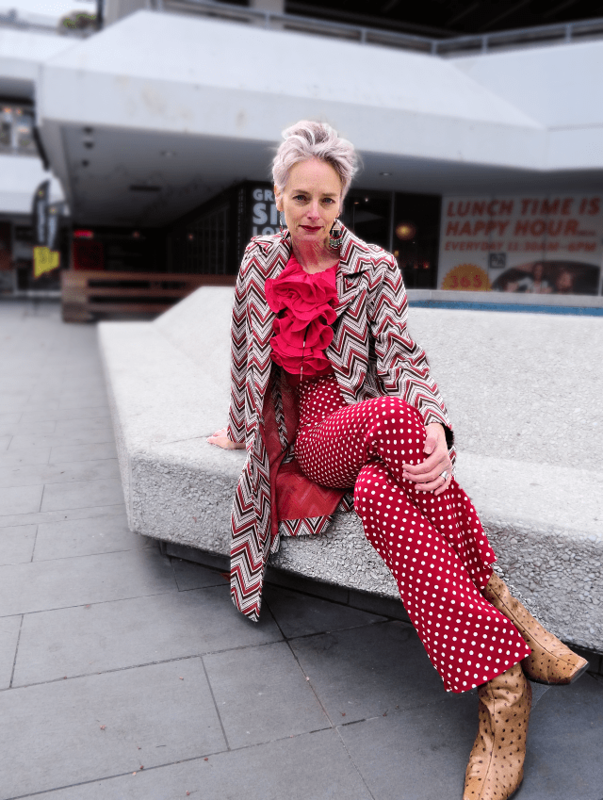 Vintage and trends – that could mean a vintage lover is 20 or more years late to hop on a trend or ahead of the trend when it comes round next time. In this case there is a surprising convergence in many cases. Velvet, yeah, never went out of style!! You have one of the best collections around. I love all your stylings here. 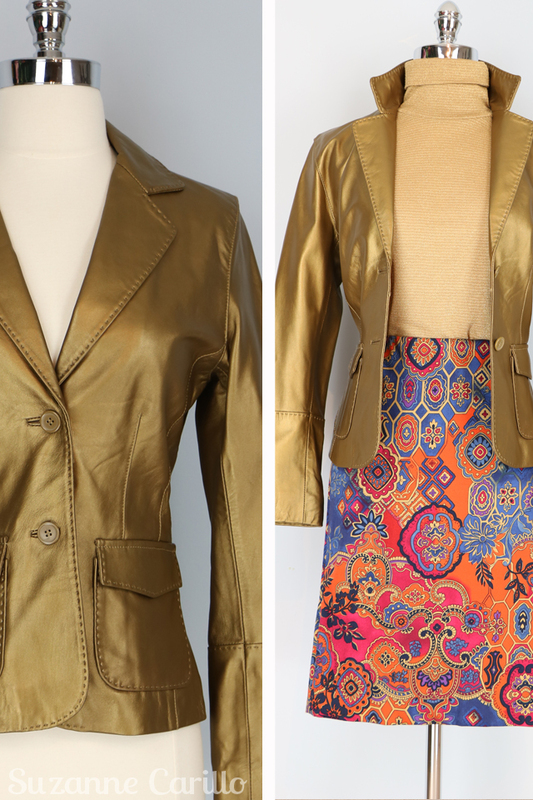 And I love that gold metallic Donna Summer jacket. Love to love ya baby. The super-long sleeves, FINALLY!! 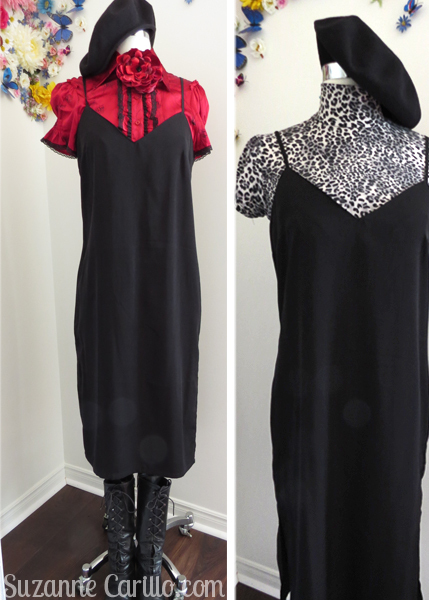 This is a favourite, a slouchy sloppy non-fit. Heh. PS Thanks for the shout-out. That’s one of my favourite ruffled blouses! Ruffles? Oh, time for chips! 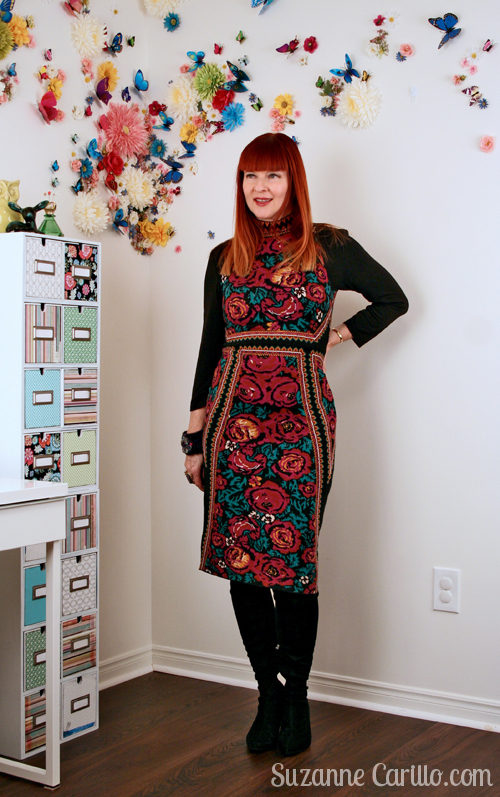 Love the floral and the velvet – how did I miss the paisley velvet jacket? Truly stunning! Those long sleeves would drive me nuts – I can’t even stand to wear the bell ones, although they look lovely on everyone else. Oh Suzanne I LOVE your style! The rich colours in these outfits is a delight to the senses. Velvet is a definite YES for me. It is opulent and delicious. As for extra long sleeves….I wish!!! My arms are long and sleeves are usually half mast on me. I get a bit excited when I find a long enough sleeve. However, dangling sleeves do not appeal! Especially when washing dishes or cleaning up after Jake (my dog)…yuck. My sleeves would be soggy and grubby in no time. 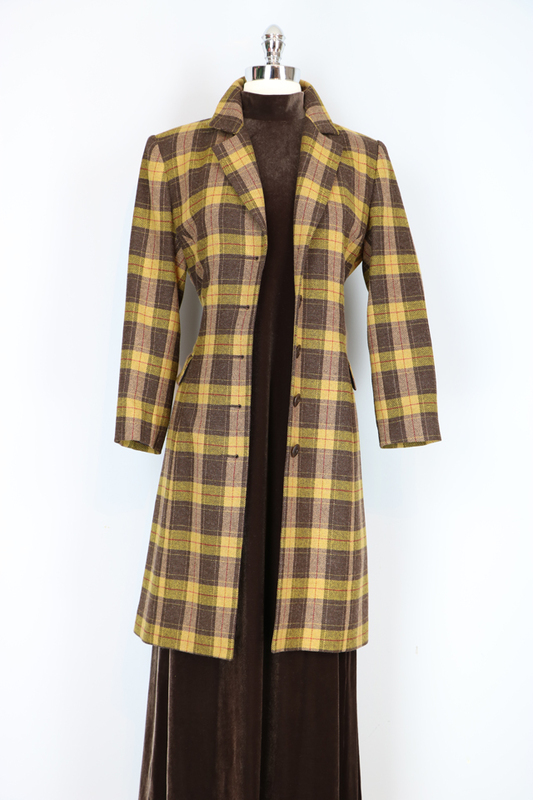 Checks and tartan coats are fab too…I was coveting yours! I have a tartan reefer (actually from a teenage boy’s range) and I wear it to death. Chokers work on me (although they highlight the crinkles now) but ruffles don’t. Ruffles make me uncomfortable. Not sure why. Maybe I could take Melanie’s lead and give them a go? They might boost my boobage a little :oP… and it’s always good to try new things, right? The longest sleeves I wear is to my hand knuckles. If the fingers are totally covered like the models, it looks like they have really long arms and their hands have been amputated. Seriously, this is not only impractical but it looks silly. Just saying. On the other hand, you my dear, are very fashionable! You re so great in styling! Everything from the outfit till the makeup and hairdo is perfect tuned on eachother! I don t like that oversized thing, please , just put on clothes that fit! But I dont like turtle neck either, it looks so wrong 70 sh. But turtleneck under a pj would probably make it as a trend as we saw the pj look last season. Also horrible. The rest I love! And has Melanie some endless legs!! Wow! Those first two runway shots make my brain nervous. 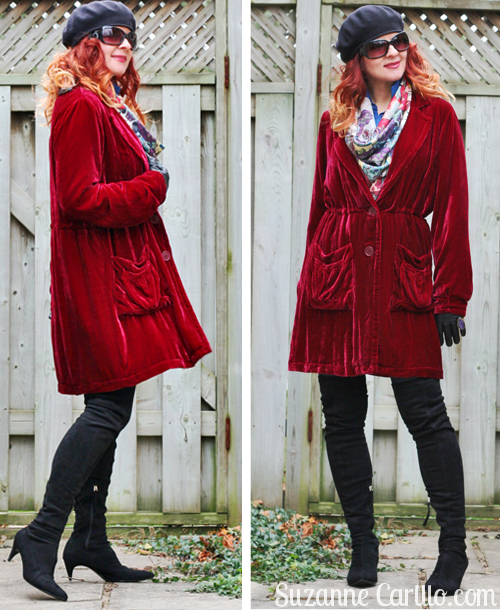 Say hell yes to velvet!!! LOVE! Ok, style icon! Your wardrobe and creativity in dressing lets us know what a true artist you are. I love to share these with Par so he knows I have a fellow partner in crime when it comes to collecting clothes. Isn’t it the craziest notion to think these stylist believe these are new trends. Well, the extra long sleeves . . . now that may be a new trend, and what the heck? I tried on the cutest cardigan last week and thought it was a mistake with the sleeves or that my petite frame was really shrinking. Only to be informed by the cute (way young) sales associate that this was the trend. Ok, so silly me I bought it anyways and then the restroom disaster hit, seriously are we not supposed to wash our hands. 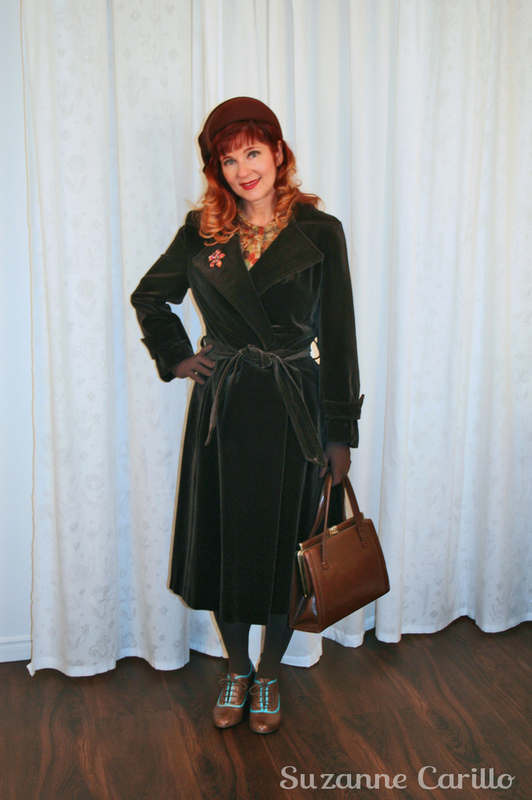 I’m happy to see the velvet come out again because I have a few fun pieces that are looking forward to being worn this year. Nothing like your incredible collection, wow! And I really like the turtleneck under the dress look, in fact I would love to find an emerald slip dress for the holidays to give the a go. Wow darling, you can style! And you have so much stuff. Heaven. Velvet is really your thing and florals. Those blue velvet boots were a clever purchase, weren’t they? I will give the extra long sleeves a miss too. I just don’t lead that kind of life. Your dusty pink boots are so cute. Great buy.